Justin Worley, originally from Atlanta, GA, has just recently completed the D.M.A. degree in tuba performance from the University of North Carolina at Greensboro. At UNCG he was the assistant for the tuba studio and he currently teaches a course in electronic music. Justin has earned a B.M. from Columbus (GA) State University and a M.M. from Boston University. He is a member of the newly formed North Carolina Brass Band and can be heard on their debut CD First in Flight. 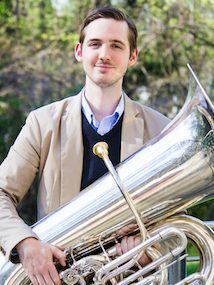 Justin was a semi-finalist for the 2013 Leonard Falcone International Tuba-Euphonium Competition and was invited to perform in the live round of the 2013 Lieksa Brass Week Competition in Lieksa, Finland. Recently, Justin performed as a soloist with the UNCG Symphony Orchestra. Justin has also performed as a member of the Columbus State University Wind Ensemble on the CD releases titled Visions and Synergy as well as performed with the Columbus State Trombone Choir at the Eastern Trombone Workshop. While at Boston University, Justin was the Assistant Conductor of the All-Campus Concert Band, performing with the ensemble as a conductor as well as a soloist. Justin has also performed as a substitute tubist the Alabama Symphony, The LaGrange Symphony (GA), The Boston Civic Symphony, and the Wellesley Symphony (MA).